Healing, 9 x 4 x 2, bronze, Douglas fir, and steel. 2012. This work was created for the Health Sciences building at Lake Superior College. 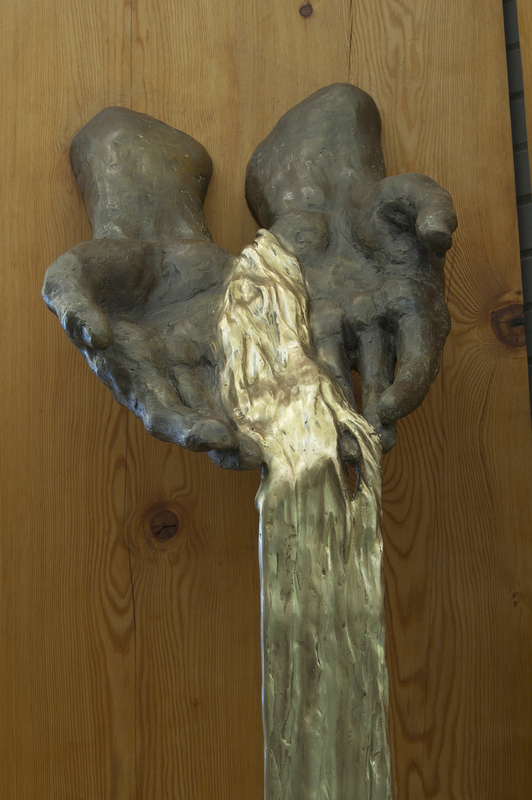 It is meant to embody the flow of healing from caregivers' hands. This work was commissioned by the Arrowhead Library Association. Here you can see it backlit by western sun in midwinter. The work is made of stainless steel expanded metal, enameled steel, and Corten (rusting) steel, and is permanently sited on the grounds of the Association's headquarters in Mountain Iron, Minnesota, on the Iron Range and near a wilderness area. The work addresses the interplay of industry and the natural world in this region. 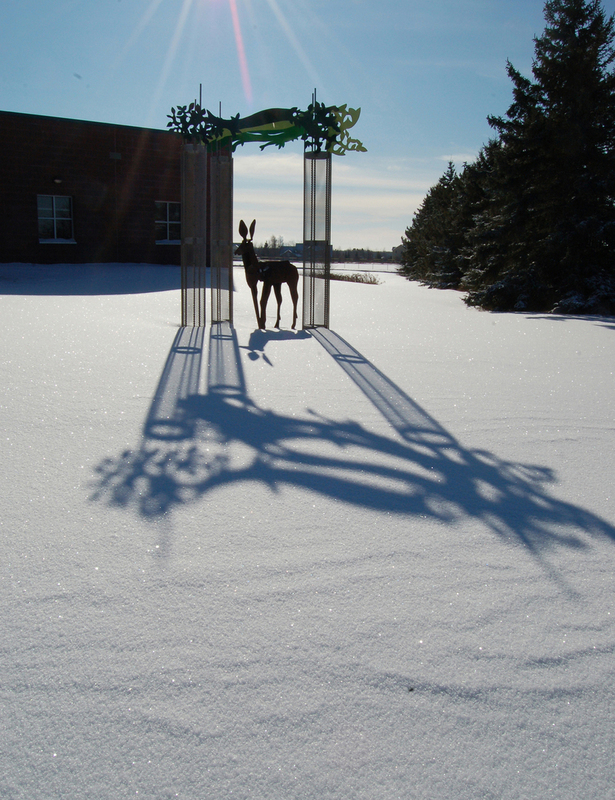 Iron Deer in the Steel Forest, stainless steel expanded metal, enameled steel, and Corten steel. 14 x 14 x 14. 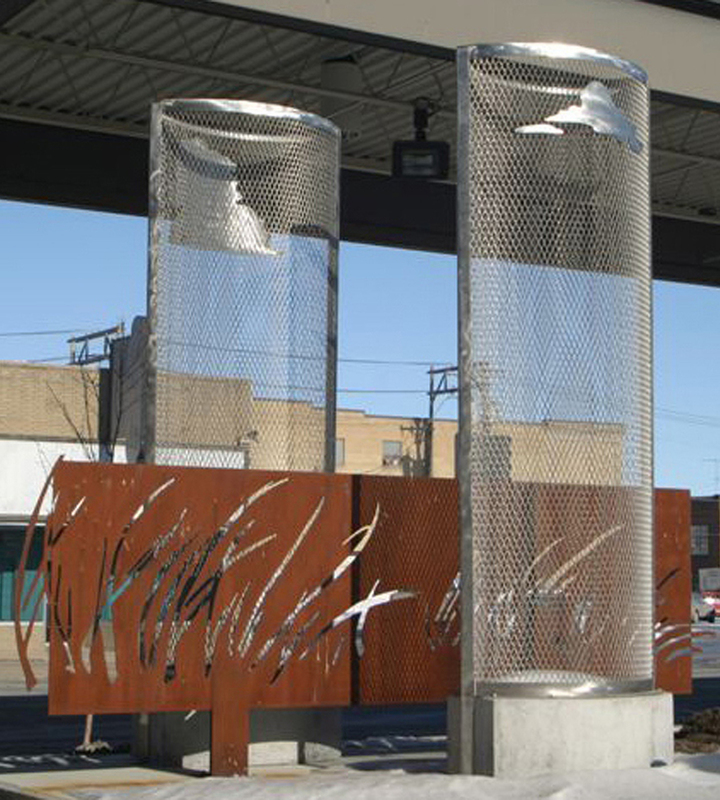 This work was commissioned by Metro Transit of Fargo / Moorhead, and is sited at the main passenger depot in Fargo's downtown. The work addresses the importance of sky and wind in the landscape; its multiple pieces have sightlines that pierce them; the translucence of expanded metal means that when the buses move around them, the light effects are remarkable. 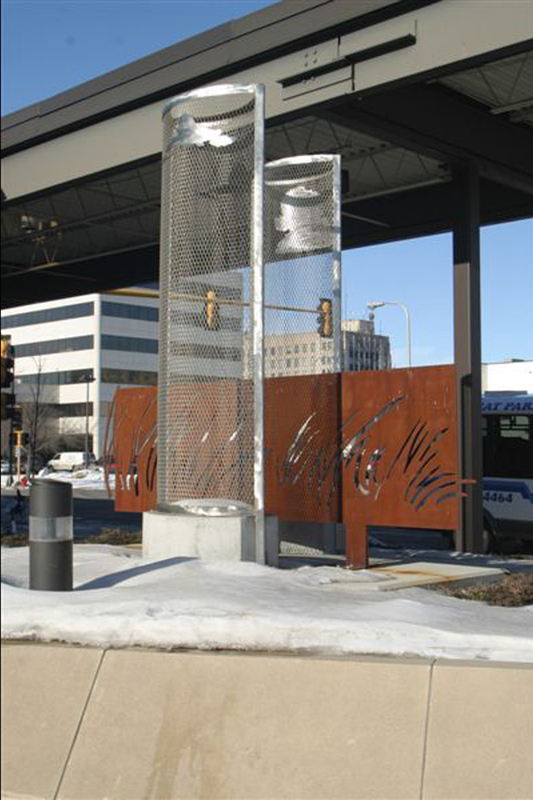 Earth : Heaven / Prairie : Sky, Fargo Metro Transit, 12' x 8' x 14', stainless steel expanded metal, Corten steel, concrete. This bronze high-relief work, about 2' x 6' x 6" deep, hangs in the Minnesota State Capitol Rotunda. 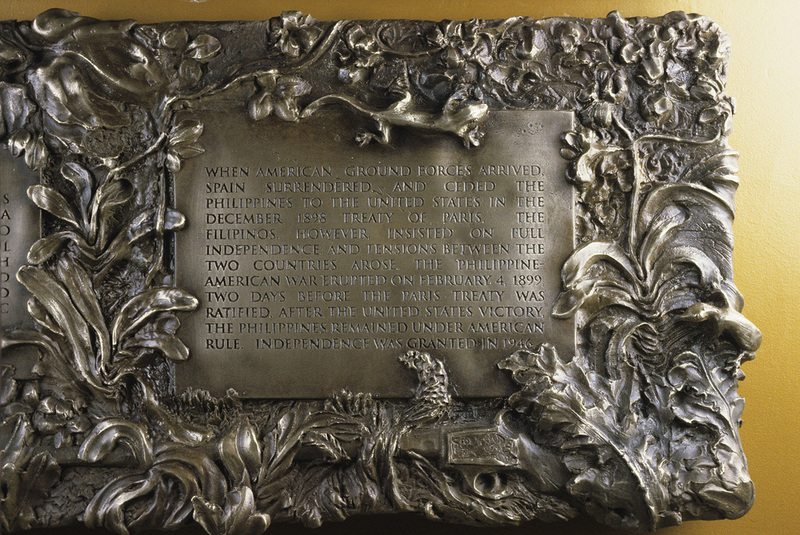 It hangs, as you can see here, directly below the lower-relief plaque commemorating the Spanish- American War, which has hung in the Rotunda since the 1920s. "Unearthing History" has an unusual story: the Philippine Community of Minnesota had long found the narrative on the original Spanish American War plaque to be historically inaccurate. They petitioned the Minnesota Legislature, which granted them $10,000 with which to commission another artwork that would tell the real story of the war and the Philippines. I was chosen to do this work, to provide a setting for their words. I chose to illustrate an implied story: that of coming upon three stone tablets, overgrown on the jungle floor, telling a story that can now be seen. The plants, the machete, the rifle, are all from the era and place of the conflict. The nineteenth-century modeling style put it in relation to the earlier work above it. Unearthing History, detail: papaya plant, house gecko, and other Philippine wild flora. 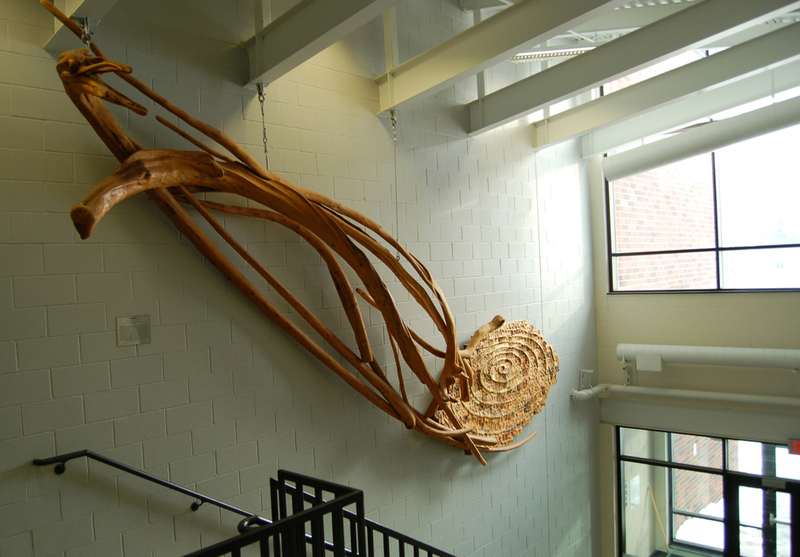 This work was commissioned by the Perpich Center for Arts Education in Golden Valley, Minnesota, and is sited in their entry atrium. 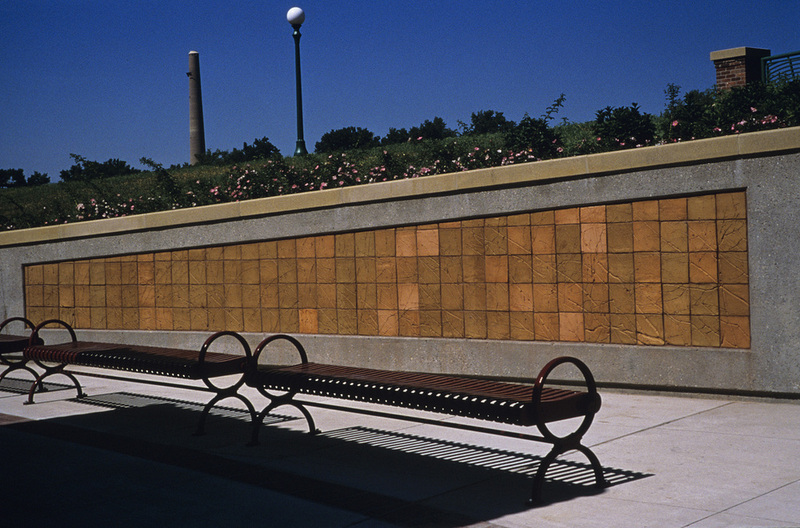 The bench (slab redwood, Mesabi granite, and steel I-beams) is the work of Glenn Gordon of St. Paul, Minnesota. I made the wall piece, which is a slab of quarter-inch steel, pickled and waxed, with bronze castings of white-pine branches in various patinas fastened to it with relief spacings. The significance of the design and materials all relate to the origins and character of Rudy Perpich, who was a beloved governor of Minnesota and who, with his wife Lola, founded the school. Gov. Perpich was a remarkably tall man who was very attached to his native Iron Range, while still being a sophisticated citizen of the world. He was also a man of great honor, who, in his political career, took the high road. White pines are native to the northern boreal forests, and are the tallest things around. Each is distinctively formed, a true identifiable individual. That is both what Gov Perpich was, and what he encouraged in his namesake arts school, a free public boarding school for the arts in Minnesota which has been remarkably successful in graduating students who go on to successful and creative lives in the arts. This sculptural environment was a collaboration with sculptor Jeffrey Kalstrom; we collaborated on making and installing the bronze wave forms, while I did the stoneware tile friezes inset into the curving walls. 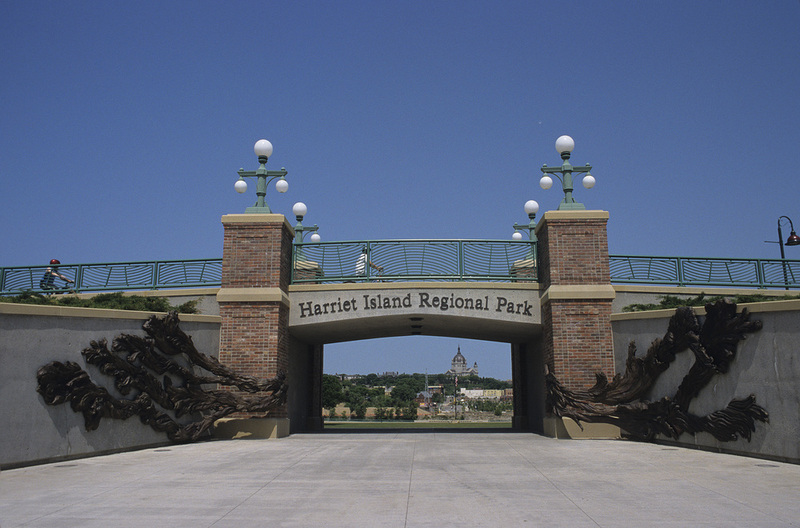 It was made for the levee gate at Harriet Island Park in St. Paul, and makes graphically evident the function of that gate by depicting in baroque bronze the floodwaters that in earlier years often devastated the surrounding neighborhood. The stoneware tiles depict flood debris; mostly plants, but mixed with occasional artifacts that were lent by residents of the neighborhoods and which I made press molds of, so that I could inset these pieces of human culture into the flow of the plant material in the tiles. See the previous image of the model for the piece for a full description. 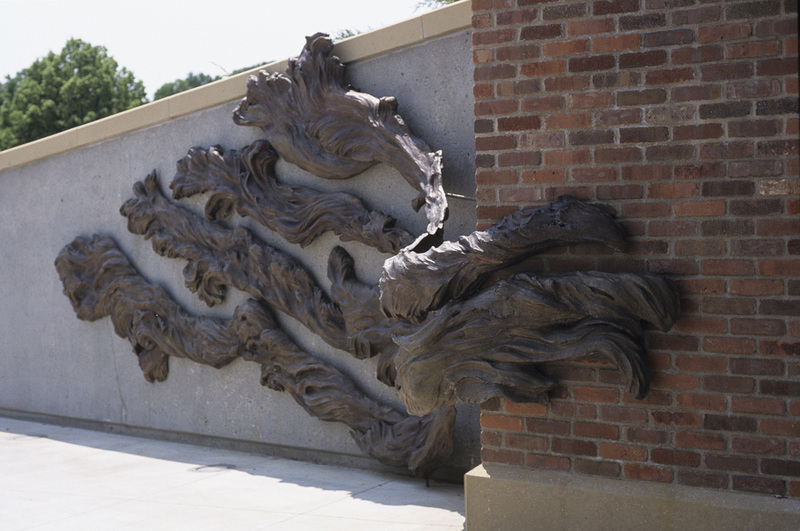 This is the levee gate with the bronze wave forms installed. Each side is about 26' x 12' x 3'. Floodwaters, bronze detail. 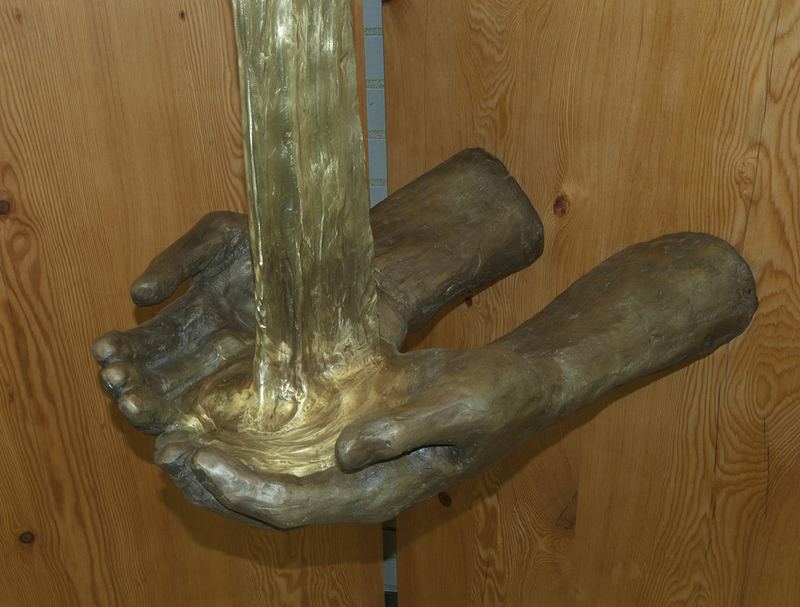 The bronze has a complex hot patina using ferric oxide, liver of sulphur, and other acids, finished with a hot wax and buffed. This gives it its variegated, shifting colors. The frieze is 24' long and 4' high at the highest end. Tiles are set into a recess in the curving concrete wall. Clay shrinkage had to be calculated very precisely to allow the tiles to fit the preexisting recess. The stoneware tiles used in this portion of the commission were handformed from high-fire stoneware with an iron-oxide component (cone 10). Slow-fired and fully vitrified, this clay body was tested outside for one full Minnesota fall, winter, and spring, set up in southwest sun for maximum temperature variance, to ensure that it would not absorb moisture or spall in these harsh conditions. The tile wall is unglazed, and has exhibited no change in almost 15 years of exposure to the famously brutal Minnesota weather. Floodwaters, tile detail. Each tile is @ 10" square, and is one inch thick. Mortar is a sanded concrete grout, and all surfaces are sealed with tile sealant. Columbia Garden Park was commissioned as a joint project from Jeffrey Kalstrom and Ann Klefstad by the City of Minneapolis as a Neighborhood Gateway. The site was 1 acre, and the work consists of this entire site. Many components are involved. Here you see the initial arc of community garden beds, and the wooden railroad-style water tower, which are the heart of the park. Columbia Park is a railroad workers' neighborhood, near the giant Shoreham Yards, the main railyard for the Twin Cities-- a huge nexus for wheat transshipment. It is, in some way, the motor that produced the wealth of the city-- the connection between the agricultural industries that built Minneapolis and the prairie wheatfields that produced the golden grain that built Minneapolis. From the top of the small park we built, from the Wheat Bench, you can see a grand vista of the glass towers of downtown Minneapolis, miles away. The park then has motifs of circles (circular crushed-limestone pathways), as Native prairie people hold the circle to be sacred, of vernacular farm architecture and shelterbelts, and of the railroad-- as seen in the functioning water tower, which enables the gardeners to water their raised beds. Here is a view from the Wheat Bench to the Picnic Shelter, built in vernacular post-and-beam style with a corrugated iron roof, seen over the native prairie plants of the wildflower garden in front of the What Bench. Here is the Wheat Bench, facing the wildflower garden and engaged with the rest of the park with the crushed-limestone circular pathways that connect the park features. These crushed-limestone paths use the same quarry that supplies baseball fields in the region, and are wheelchair-safe. The center of the Wheat Bench plaza is a millstone, reproduced in concrete, that is a mandala-like evocation of the flour mills of Minneapolis. The Wheat Bench and plaza is 26' long and 12' deep. Inset into the bench back are three bronze castings of actual ears of wheat that I cut from a field near Crookston, Minnesota. Here the Wheat Bench can be seen with the two silver maples we planted as shade trees just behind it. The lot when we started had been an industrial waste dump, with no trees, and its subsoil was full of chunks of asphalt and slag from a foundry. Some of those slag chunks are preserved in the rock garden winding its way through the prairie wildflowers in front of the Wheat Bench. 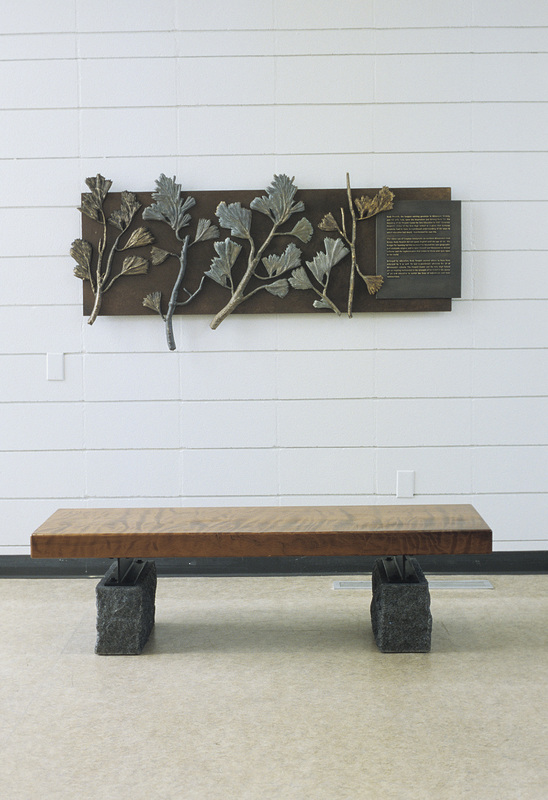 Here is one of the bronze reliefs of prairie wheat installed in the back of the Wheat Bench. There are three of them, two smaller and the central one larger. This work was commissioned from Ann Klefstad and Jeffrey Kalstrom for Hibbing Community College, and depicts the flow of natural resources from their "wild" state into usable forms. The work overall is 34' long, 18' tall, and about 2' - 3' deep. This detail is of the Archimedes' spiral constructed of milled lumber, locked together with a structure of interlocking steel rods, and carved, the spiral picked out with gold leaf to use the dramatic sidelighting of the windows. Here is the work from below. The waterfall forms are created using white-cedar logs that grow in dramatic curves in the walls of the precipitous boreal creeks that fall down to Lake Superior in this region. These trees grow in stone canyon walls, fall into the water, and swirl in waterfall pools. We pulled them out of the creeks, peeled and oiled them, and bolted them into the waterfall form you see. The "pool" is formed of milled lumber and carved with the spiral of the first historical engineer. Here is the work seen from above. Hibbing Technical College, where this work is sited, trains young people in engineering and building finished work from natural raw materials. That is what this work addresses. 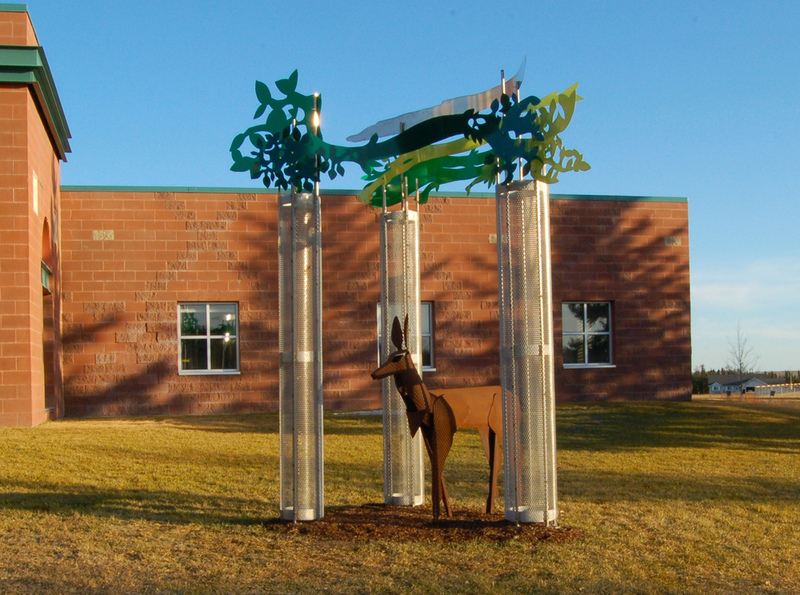 This work was commissioned by the Duluth Community Garden program as one of a group of works made by members of Common Language, a Duluth artists' coop. The inspiration was my then-five-year-old son, whose valiant struggles with the oversized adult world were moving to me. I took an old kitchen chair and scaled it up so that the resulting piece was as big for a 6' adult as a regular kitchen chair was for a five-year-old. It serves as a viewing bench high on the hill above Duluth, at the site of a community garden. Almost 20 years later, it is still there and solid-- it was built of local white cedar and reinforced with steel by Jeffrey Kalstrom.